The following resources are news features and online resources that feature Danny in both large and small roles and multiple capacities. This area is where you can find news excerpts that are NOT directly related to and are not endorsed or paid for by the candidate or campaign committee. Nor do the organizations featured endorse or share any specific views of the candidate. By: Sydney Gray | Posted: Tue 4:52 PM, Apr 03, 2018 | Updated: Tue 6:52 PM, Apr 03, 2018|Retrieved from KXII Website on 05/15/18. Click Here! ADA, Okla. (KXII) - "Oklahoma needs another couple of days to advocate for students. "Ada 8th and 9th grade english teacher Katy Peercy said. Ada English teachers Katy Peercy and Leslie Landrum went back to the state capitol Tuesday for the second day of the statewide teacher walkout. Teachers from Ada and Byng rented a school bus to attend Monday's rally at the capitol. "What a wonderful outpouring of support, for public education," Ada 7th grade english teacher Leslie Lnadrum said. Thousands of teachers spoke to state legislators in hopes of finding a solution. "Senator McCortney was very honest with us, he was able to address a very large group of us," Byng kindergarten teacher Janel Manuel said," we left feeling good about our conversation." Manuel says Senator Greg McCortney tells her the Ball and Dice bill would provide $16 million for education funding.She says house representative Todd Thomsen says residents need to ask legislators to vote for the capital gains tax. Latta was the only Pontotoc County school district that remained closed Tuesday for the strike. "I'm competely okay with what they did, Latta parent Joshua Hatton said, "it may have inconvenienced some people that have to work, but at the same time they're doing it for a good reason." Teachers say they hope students realize they aren't walking out on them. "I think more than anything else, every individual Oklahoman needs to recognize the power of his or her own voice," Peercy said. Most Pontotoc County school districts will continue to send advocacy groups to the capitol for the rest of the week. By: Ashley Holt, Posted at: 7:56 PM, Apr 11, 2018, Updated: 4:31 AM, Apr 12, 2018|Retrieved from KJRH Website, click here. OKLAHOMA CITY, Okla. - Four hundred and fifty-eight people filed to run for statewide elections on the first possible day Wednesday. Hundreds of people received the stamp of approval. “I believe that it’s very important that our children get a great education.” Professor Aiya Kelley is running for Pawnee County's Senate seat. “I want my children to have the same educational opportunity that I had as a student, and right now they don’t have that." Daniel Manuel is a firefighter, bus driver and husband of a teacher. He's running for Ada's House seat. But a familiar face was also in the crowd of hopefuls. “It’s exhilarating, it’s nerve-wracking, it’s terrifying, it’s wonderful," said Booker T. High School teacher John Waldron. He signed his name for northeast Tulsa's House seat left open by Eric Proctor. “I want to see more pro-education candidates in there, I want to see more candidates who had to face the vote of the people in a general election," Waldron said. He, like many others in line, wants to finish what the teachers filling the Capitol for eight days have started. “It may be that we’re not going to win until we win some elections.” In a statement Tulsa Public Schools said it's proud to see its teachers stepping up to the challenge; teachers like Waldron who have a message for lawmakers that still won't vote to further fund public education. “Remember, remember we vote in November," he said. People who want to file for candidacy must got to the Capitol by Friday at 5 p.m. Wednesday's numbers already surpass those of total House and Senate candidates in both 2014 and 2016. Submitted Story |Retrieved from The Ada News Website on December 29, 2017, click here! On Saturday, more than 350 residents from the Ada area united in a movement to reclaim the future for millions by raising awareness and funds for the fight to end Alzheimer’s. The event finished shy of its total fundraising goal, but there is still time to add to the number. Southeast Walk Manager Paula Huckabaa encourages everyone to keep raising funds through Oct. 31. Walk to End Alzheimer’s participants did more than complete a walk around Wintersmith Park. They learned about Alzheimer’s disease and the Association’s critical role in the fight against it, including the latest about Alzheimer’s research and current clinical trials, how to become involved in advocacy efforts at home and in Washington, D.C., and where they can find local support programs and free services provided by the Association. The event also included an emotional tribute to honor those affected by the disease, featuring colored flowers to represent people’s different reasons for ending Alzheimer’s. This year, a white flower was added to represent the first survivor of Alzheimer’s disease — a person the Alzheimer’s Association will find someday with the help of committed people like those at the Walk to End Alzheimer’s — Southeast Oklahoma. “The Association extends a special thank you to National Presenting Sponsor Edward Jones,” Huckabaa said. For more information and to make a donation today, visit seokwalk.org. The Alzheimer’s Association Walk to End Alzheimer’s is the world’s largest event to raise awareness and funds for Alzheimer’s care, support and research. Since 1989, the Alzheimer’s Association mobilized millions of Ahas mericans in the Alzheimer’s Association Memory Walk®; now the Alzheimer’s Association is continuing to lead the way with the Walk to End Alzheimer’s. Together, we can end Alzheimer’s – the nation’s sixth-leading cause of death. The Alzheimer’s Association is the leading voluntary health organization in Alzheimer’s care, support and research. Our mission is to eliminate Alzheimer’s disease through the advancement of research; to provide and enhance care and support for all affected; and to reduce the risk of dementia through the promotion of brain health. Our vision is a world without Alzheimer’s. Visit alz.org or call (800) 272-3900. 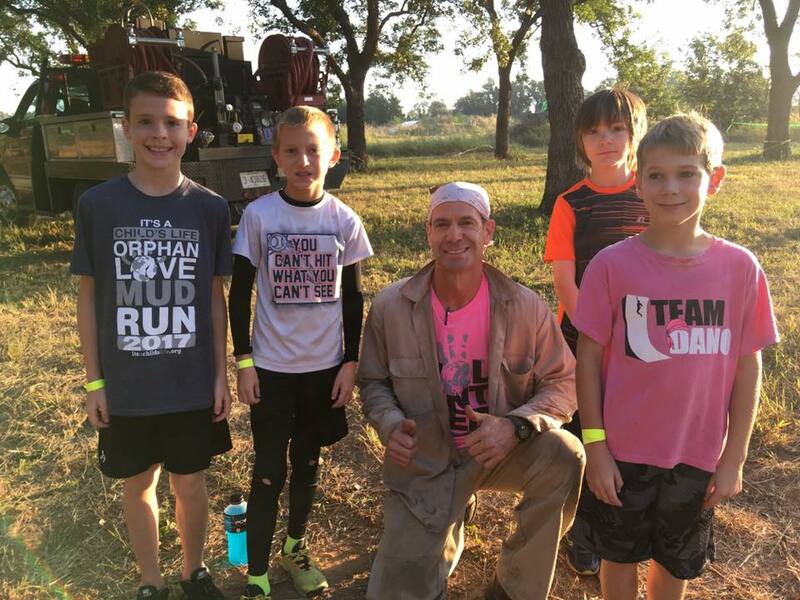 ADA, Okla (KXII) -- More than 500 people are expected to lace up their sneakers for the 6th annual Orphan Love Mud Run in Ada this Saturday. Denson said.Denson is a member of one of the founding families of the It's a Child's Life Foundation. The Foundation has raised $78,000 to help 33 families with the adoption process during the past five years. "Adoption started becoming more of a common thing in this area, and with private adoption especially, the financial obligations for adopting families to meet are astronomical," Denson said. Denson says money from this year's mud run will help six local families trying to adopt. Proceeds will also go toward local non profits like the Ada Boys and Girls Club and A'Layah's Lemonade for Love. "I just kind of feel the need to support those families who have heart for adoption because not everybody does," Nonprofits Coordinator Andrea Hill said. "I just think giving them the support that they need is phenomenal." "It really is an opportunity to give back and to do something for someone else that's so much greater than any of us," course designer Danny Manuel said. "It's a unique way to invite other people into this. "Manuel says he was adopted and has been trying to adopt a child from Ethiopia for the past five years. He says the mud run means a lot to him, which is why he designed the three and half mile course. "There's some obstacles on this course that competitors will be able to do, some obstacles competitors have to work together because there's obstacles in life," Manuel said. "Sometimes in life we have to work together to overcome stuff." Manuel says he expects at least 500 people to participate. Anyone who still wants to register can visit the Chickasaw Family Services Center from 4 -7 p.m. on Friday, or you can register at the course beginning at 7 a.m. on Saturday. The mud run cost $20 for children younger than 12, and $65 for adults. 2017 OLMR Promo Video Here! By: Brittany Harlow | Posted: Tue 5:18 PM, Feb 02, 2016 | Updated: Wed 9:37 AM, Feb 03, 2016|Retrieved from KXII website, click here! ADA, Okla.- Multiple agencies and departments in Pontotoc County came together on Tuesday to intentionally set a pasture ablaze. Ada Professional Firefighters, Ada Fire Department, Bureau of Indian Affairs Chickasaw Nation Fire Management Division, Byng Volunteer Fire Department, the City of Ada and DustBowl Films joined forces on Tuesday to make a public service announcement demonstrating how important it is to maintain vegetation around structures, vehicles and farm equipment. “Just a little bit of effort in maintaining vegetation can make just a huge difference on preventing fire loss and right now we are entering prime grassfire season,” Ada Fire Captain and Risk Reduction Educator Danny Manuel said. Pontotoc County Emergency Management Director Chad Letellier said there have been 23 wildfires in Pontotoc County alone within the last week and a half. Letellier said the wind also picks up this time of year, which is another significant factor in how bad the wildfires can be. And it doesn’t take much to spark one. Welding, cutting, burning trash, evening chains dragging on the road and trains going by can start a wildfire. Manuel said the key is to keeping the fires contained as possible once they begin. Manuel asks that the public have their address clearly marked from the road to where emergency responders can see it. He also said drivers should be prepared for an increase in responders out on the road. “We always say, whenever you see the lights, pull to the right,” Manuel said. The PSA is expected to hit the Internet in about two weeks. ADA, OKLAHOMA -- For nearly an hour a day, six days a week, Daniel Manuel climbs ropes in his barn. He practices his balance on a flat-bed trailer rail, and does more than a few of his special pull-ups. But when he saw his first American NInja Warrior TV show, he went bigger. "Since I've been pursuing American Ninja Warrior, I've really turned it up a notch," he says. The Manuel family consists of Daniel, wife Janel, daughter Grace, and son Blaise. They live in a white house with a big porch in the old Oakman community north of Ada. They have a couple of sheep, and a few new kittens. Then, right around the time Daniel decided to train for the show, the whole family decided to carry the weight of another family member, an orphan from Africa. "I was adopted as a toddler," says Daniel, "and, every day, I'm thankful for the family that God has blessed me with. Even as a young person I knew that giving back the way that I was given to was something that I wanted to do." Daniel dedicated his appearance on the show to his family's ongoing adoption efforts. Adopting a child, even through an accredited agency requires running a different kind of obstacle course. Manuel says, "I've made the comment that I think it would be easier to work for the CIA than adopt internationally." His kids are pretty good climbers. Young Blaise wrote in his kindergarten journal about being a Ninja himself. "I can be a Ninja," he wrote. Just qualifying for the show was tough enough, but the rewards for both of his big quests are worth the reach, at least according to this family Manuel. A visitor notes the already crowded bench on the front porch. Janel Manuel responds, "We just have to get a bigger bench." Daniel echoes, "Or we can squeeze one more in. "Danny Manuel made a short appearance on the Monday evening edition of American Ninja Warrior. He found trouble on the vertical wall section of the obstacle course and didn't finish.